We’d love your help. Let us know what’s wrong with this preview of The Christmas Bike by Tara Mayoros. Published October 11th 2016 by Cedar Fort, Inc.
To ask other readers questions about The Christmas Bike, please sign up. Reading stories like this is better than any Christmas treat! The perfect book to tug at your heart-strings and remind you what's really important about not only Christmas...but life! The new book by author Tara Mayoros is only 51 pages long,but it packs a powerful punch to your heart. The Christmas Bike tells the heart-warming story of a woman’s journey of remembering the true meaning of Christmas on Christmas Eve. This book is based on true events that happened to Tara and her son. In fact, this son that the story is based on, is the son that I taught in second grade a few years ago. So this story touched my heart is a huge way. Every part of the story that mentioned "Anth The new book by author Tara Mayoros is only 51 pages long,but it packs a powerful punch to your heart. 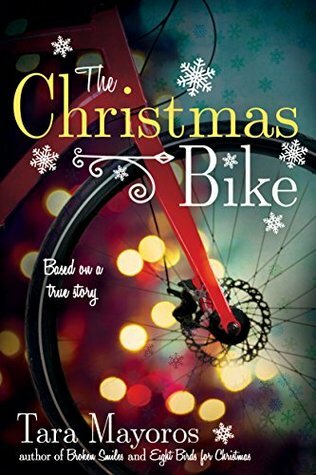 The Christmas Bike tells the heart-warming story of a woman’s journey of remembering the true meaning of Christmas on Christmas Eve. This book is based on true events that happened to Tara and her son. In fact, this son that the story is based on, is the son that I taught in second grade a few years ago. So this story touched my heart is a huge way. Every part of the story that mentioned "Anthony" I could see this boy's face in my mind. In The Christmas Bike, Marie and her family have recently moved away from their home state of Utah to Arizona. Their finances are tight and their lives are busy trying to make ends meet. The main thing on Marie's mind is how she's been too busy for decorations and baking like she's usually done before Christmas. In other words, the true meaning of Christmas wasn't at the forefront of her mind as things weren't going their way. On Christmas Eve day, a quick bike ride to the store turns into a sad and shocking event when Anthony's bike is stolen. All of the anger and frustration of only being gone ten minutes and then to come out to the bike being gone is clearly felt. As a parent myself I know how I would feel if this had happened. Mayoros writes so truthfully and from the heart that you are instantly placed in her thoughts and feelings. The rest of the story is her spending the day trying to find another bike for her son. Miracles take place that day that had truly started the day before. One thing after another happens that open Marie's eyes to her remembering the true meaning of Christmas. The story ends in such a beautiful way. I found myself crying in the back seat of the car on my vacation, while traveling around the beautiful Big Island of Hawaii. The following words from the end of the story will stay with me as I know they will you once you read the book. "Did it matter who had stolen the bike? Did the scenario matter? Whoever had done this had a great enough motivation to potentially ruin a child's Christmas Eve. I forgave the person, whoever they were. It was actually pretty easy to do. Peace fell upon me like a warm blanket...Christmas had brought things, but we also had a home full of Christ and I made a commitment to carry more of Him throughout the new year." I really enjoyed this novella by Tara Mayoros. The events actually happened, so that makes it even more meaningful to me. It was a good reminder of forgiveness and that many times in our lives, others are put in our path to help us along the way. I highly recommend this book as a quick reminder of what is most important this Christmas season. Powerful, funny and without all that fake you expect in a Christmas story. Yes, Christmas rocks. But Christmas also suuuuuucks. Like so bad. Like what mom has the time and money to deliver Christmas to the kids in the way she wants? Not Marie. And not me! I loved the voice in this. I felt myself on every page. And the ending was refreshing and honest. Enjoy it! Written by a friend whose son, Crew, went to my preschool. Shawna Powelson, her mother lives in my ward. Tara moved to Arizona after living here and trying to help her husband make a business at Pirate Island Pizza Restaurant by the Mall. Too bad it failed. Happy for her that she is enjoying writing books. A very sweet and touching Christmas story about losing your way, going through hardships, and little miracles that happen along the way. This book beautifully illustrates that small acts of kindness can have far reaching effects and that no matter where we are we can always "bloom where we are planted." A young boy's bike is stolen days before Christmas. The mom scrambles all over town to try to replace it. She recognizes her blessings along the way and finds forgiveness and the true meaning of Christmas. A beautifully written Christmas story about the love of a mother and the very human wanting of things that we don't always have. Insightful and real. Years, marriage, children and many adventures later, she picked up her dusty pen and paper (or laptop) and realized that writing took her to different wor As a child, Tara Mayoros moved to Asia with her family where her love of different cultures and travel began. In college she satisfied her wanderlust by moving to China, filling her head with countless stories, and occasionally writing them down.